90 Days of God's Goodness by Randy Alcorn is meant to be used as a three month devotional reminding us of the goodness of God in our everyday lives. This would be a particularly fantastic devotional, reaching deep into the heart, for people who have been hurting in life or struggling through situations seemingly out of control. 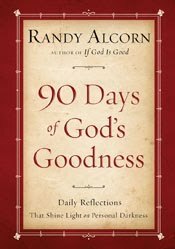 Through out the daily devotionals (each about two pages long), Randy continually points the reader to God's love and goodness, even in the midst of pain and darkness. I was sent this book by the publisher to review. In no way was my review influenced by its freeness. I'm going to look for the book at the Homeschool Conference. His books are very insightful.